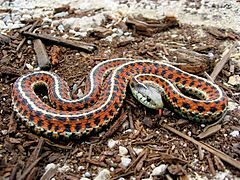 Colubridae (from Latin coluber, snake) is a family of snakes. With 524 genera and approximately 1,760 species, it is the largest snake family, and includes just over 51% of all known living snake species. The earliest species of the family date back to the Oligocene epoch. Colubrid snakes are found on every continent except Antarctica. While most colubrids are not venomous (or have venom that is not known to be harmful to humans) and are mostly harmless, a few groups, such as genus Boiga, can produce medically significant bites, while the boomslang, the twig snakes, and the Asian genus Rhabdophis have caused human fatalities. Some colubrids are described as opisthoglyphous, meaning they have elongated, grooved teeth located in the back of their upper jaws, often called "rear-fanged". Opisthoglyphous dentition likely evolved many times in the history of snakes and is an evolutionary precursor to the fangs of vipers and elapids, which are located in the front of the mouth. In the past, the Colubridae were not a natural group, as many were more closely related to other groups, such as elapids, than to each other. This family was historically used as a "wastebasket taxon" for snakes that do not fit elsewhere. Until recently, colubrids were basically colubroids that were not elapids, viperids, or Atractaspis. 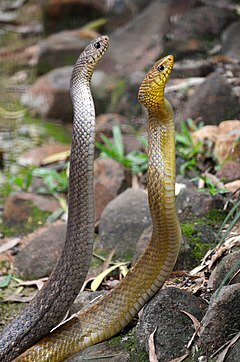 However, recent research in molecular phylogenetics has stabilized the classification of historically "colubrid" snakes and the family as currently defined is a monophyletic clade, although additional research will be necessary to sort out all the relationships within this group. As of May 2018 eight subfamilies are recognized. These taxa have been at one time or another classified as part of the Colubridae, but are now either classified as parts of other families, or are no longer accepted because all the species within them have been moved to other (sub)families. ^ "Colubrid". britannica.com. Britannica. Retrieved 2 December 2018. ^ a b c Bauer, Aaron M. (1998). Cogger, H.G. ; Zweifel, R.G. (eds.). Encyclopedia of Reptiles and Amphibians. San Diego: Academic Press. pp. 188–195. ISBN 0-12-178560-2. ^ a b c Bruna Azara, C. (1995). "Animales venenosos. Vertebrados terrestres venenosos peligrosos para el ser humano en España" (PDF). Boletín de la S.E.A. 11: 32–40. ^ Weinstein, S. A.; Warrell, D. A.; White, J.; Keyler, D. E. (2011). Venomous bites from non-venomous snakes: A critical analysis of risk and management of "colubrid" snake bites. London: Elsevier. ^ Jackson, K (2003). "The evolution of venom-delivery systems in snakes" (PDF). Zoological Journal of the Linnean Society. 137: 337–354. ^ Vonk, F. J.; Admiraal, J. F.; Jackson, K.; Reshef, R.; de Bakker, M. A.; Vanderschoot, K.; van den Berge, I.; van Atten, M.; Burgerhout, E.; Beck, A. (2008). "Evolutionary origin and development of snake fangs" (PDF). Nature. 454: 630–633. ^ Fry, B. G.; Casewell, N. R.; Wüster, W.; Vidal, N.; Young, B.; Jackson, T. N. (2012). "The structural and functional diversification of the Toxicofera reptile venom system" (PDF). Toxicon. 60: 434–448. ^ Lawson, R.; Slowinski, J.B.; Crother, B.I. ; Burbrink, F.T. (2005). "Phylogeny of the Colubroidea (Serpentes): New evidence from mitochondrial and nuclear genes" (PDF). Molecular Phylogenetics and Evolution. 37: 581–601. doi:10.1016/j.ympev.2005.07.016. PMID 16172004. ^ Scott A Weinstein; David A Warrell; Julian White; Daniel E Keyler (20 June 2011). "Venomous Bites from Non-Venomous Snakes: A Critical Analysis of Risk and Management of "Colubrid Snake Bites. Elsevier. p. 1. ISBN 978-0-12-387755-0. ^ Fry, B.G. ; Vidal, N.; van der Weerd, L.; Kochva, E.; Renjifo, C. (2009). "Evolution and diversification of the Toxicofera reptile venom system". Journal of Proteomics. 72: 127–136. doi:10.1016/j.jprot.2009.01.009. PMID 19457354. ^ Pough, F. H.; Andrews, R. M.; Cadle, J. E.; Crump, M. L.; Savitzky, A. H.; Wells, K. (2004). Herpetology (3rd ed.). Upper Saddle River (NJ): Prentice Hall. p. 162. ISBN 0138508763. ^ Pyron, R. A.; Burbrink, F.; Wiens, J. J. (2013). "A phylogeny and revised classification of Squamata, including 4161 species of lizards and snakes". BMC Evolutionary Biology. 13: 93. ^ Figueroa, A.; McKelvy, A. D.; Grismer, L. L.; Bell, C. D.; Lailvaux, S. P. (2016). 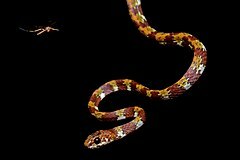 "A species-level phylogeny of extant snakes with description of a new colubrid subfamily and genus". PLoS ONE. 11: e0161070. ^ a b c d e f g h Pyron, R. A.; Burbrink, F. T.; Colli, G. R.; de Oca, A. N. M.; Vitt, L. J.; Kuczynski, C. A.; Wiens, J. J. (2011). "The phylogeny of advanced snakes (Colubroidea), with discovery of a new subfamily and comparison of support methods for likelihood trees" (PDF). Molecular Phylogenetics and Evolution. 58: 329–342. ^ Zheng, Y; Wiens, JJ (2016). "Combining phylogenomic and supermatrix approaches, and a time-calibrated phylogeny for squamate reptiles (lizards and snakes) based on 52 genes and 4162 species" (PDF). Molecular Phylogenetics and Evolution. 94: 537–547. ^ Uetz, Peter. "Colubridae at The Reptile Database". The Reptile Database. EMBL. Retrieved 13 May 2018. ^ a b Savage, Jay M. (2015). "What are the correct family names for the taxa that include the snake genera Xenodermus, Pareas, and Calamaria?". Herpetological Review. 46 (4): 664–665. This page was last edited on 6 March 2019, at 01:59 (UTC).